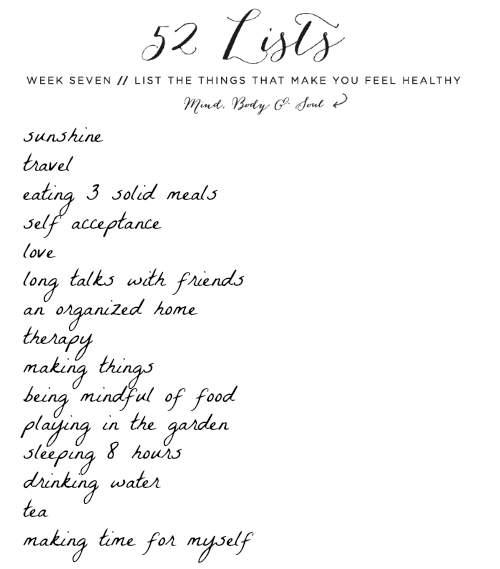 This weeks list is all about being healthy. I think I am still in a process of learning all the things that make me feel healthy as a person, but this was a really great reminder and chance to give it a bit of thought. Just like many of the past lists so far, this is a great reminder of what I need to do a bit more of in my life! Learn more about the 52 Lists Projects here. I love your list and the pretty font. Those are great! I totally agree with all of them! :) Great list!